Grade Point Average & Test Scores? 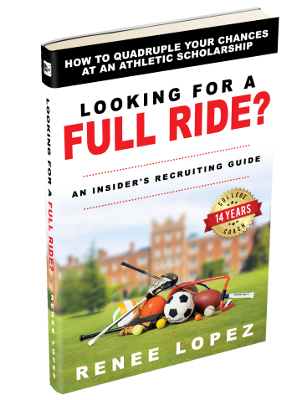 After interviewing over 65 college coaches and athletic directors for my upcoming book (due out Summer 2019), Looking For A FULL RIDE? 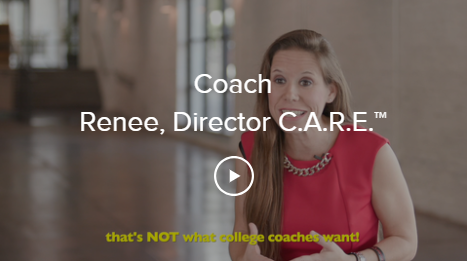 : An Insider’s Recruiting Guide, almost all of them spoke about those characteristics as being part of the process of researching potential recruits. I believe there are other 2 key areas student-athletes rarely realize college coaches evaluate in determining scholarship offers. Second, numerous college coaches spoke on the value of watching recruits over time (versus. just attending one competition) to evaluate your daily disciplines. Coaches want to know what you do daily, not only in being disciplined academically, but especially in your health. One of the reasons college coaches want student-athletes to attend camps is that it allows them the opportunity to see recruits in multiple settings and learn more about all aspects of an athlete. Will you take the proper steps to recover after a long day of camp? Did you seek out ice for that injury? What type of stretching did you do? What type of food choices are you making in the cafeteria lines? How have you hydrated yourself? Wait, what? Yes, college coaches watch if you know how to properly hydrate yourself before, during, and after training. 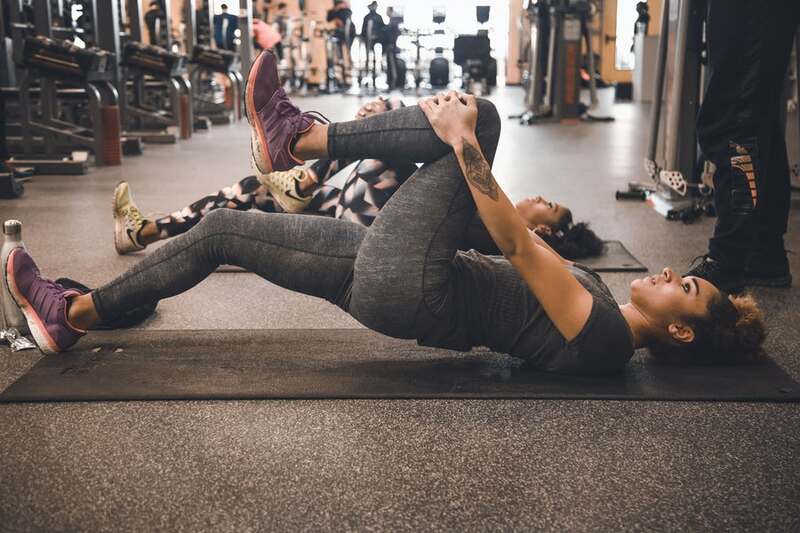 Especially for outdoor sports attending camps in the summer heat and humidity, we watch to see if you know how to take care of your body to perform at its best. 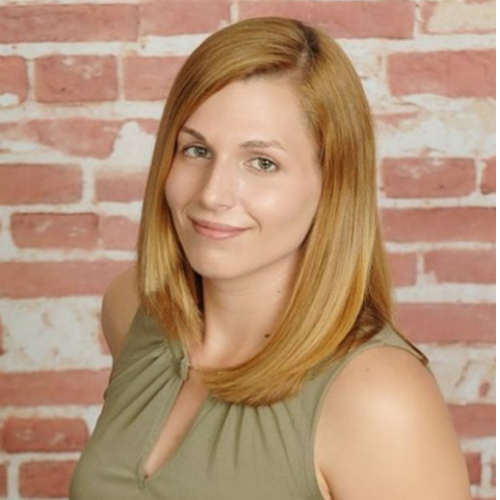 Many of you reached out saying how much you appreciated our previous guest blog on Fueling Your Body, so I decided to again ask my colleague Jackie Slomin, a Sports Dietitian, who focuses on working with high school student-athletes, to offer information about proper hydration plans. “When I feel thirsty,” is almost always the answer I hear regardless of what sport the athlete plays. Obvious answer, right? However, one of the quickest ways for an athlete to ruin their performance is by not hydrating properly. The scary part is that looking at statistics, the majority of youth athletes are dehydrated during practices, with some studies estimating dehydration regularly affects up to 75% of athlete’s during training. As many outdoor sports seasons are set to begin in August heat, the risk of being dehydrated is even higher, as the heat causes many athletes to increase their sweat rate. So how exactly do we know what dehydration looks like? Typically, when an athlete ‘feels’ thirsty, it means that they are already on the way to being dehydrated. Even mild dehydration can cause fatigue, headaches and muscle cramping. Being proactive about fluid intake can make a BIG impact in performance, recovery, energy levels, and mental focus as well. Every athlete should have a fluid plan to keep properly hydrated consistently throughout the day. Every athlete will have different needs depending their size, level of activity, sweat rate, and electrolyte losses throughout the day. According to the 2004 Dietary Reference Intake (DRI), adequate intake for water is 16 cups for boys and 12 cups for girls before considering any physical activity. Athletes who train in hot, humid conditions, who are heavy sweaters (when you see and feel a white chalky residue on the skin– this is sodium and electrolytes being lost) or exercise for 2 hours per day, could need double of the recommendations. It’s no wonder so many athletes are constantly dehydrated– even if they don’t know it. One way to solve this is to use the ‘urine check’ method. It’s simple: the lighter colored urine is, the better hydrated. 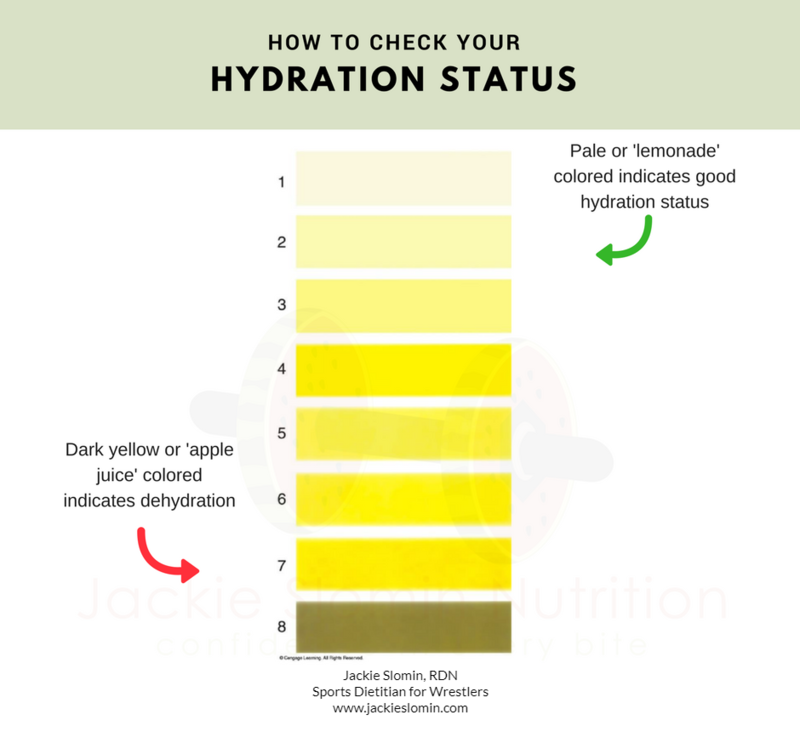 A very pale, yellow color is typically considered well hydrated, while those who have a more amber, apple juice color are likely dehydrated. An additional 16-20oz of fluids should be consumed within 2 hours of the end of training to top off fluids and ensure any water losses that have been lost were replaced. Keep in mind, each athlete has different needs. While these recommendations are a good start, it isn’t a guarantee they will meet your athlete’s requirements nor should they be used if your athlete has any health conditions without first consulting their doctor or pediatrician. Individualized hydration plans based on an athlete’s unique sweat rate and water loss are a more accurate way to measure and create a hydration plan and can be conducted by a professional. Dehydration affects many athletes, and unfortunately the method of ‘drinking when thirsty’ can often be too little, too late. By following a few simple recommendations and creating a hydration plan, you can perform without worry! Download your FREE hydration status assessment and Sports Drink vs Fluid guides here. Having previously worked with hundreds of NCAA Division I and II student-athletes from all different sports and having a graduate degree in sports nutrition and exercise science, Jackie Slomin is an expert at helping high school student-athletes discover how to improve their performance, energy, and recovery time by up to 50% with advanced sports nutrition principles that can be used by even the busiest of families. Jackie works with student-athletes, families, coaches, and teams to help them discover how to gain a competitive edge through nutrition. When Jackie isn’t working with athletes, she loves weight training, kayaking and trying new foods. You can contact her at info@jackieslomin.com and www.jackieslomin.com. 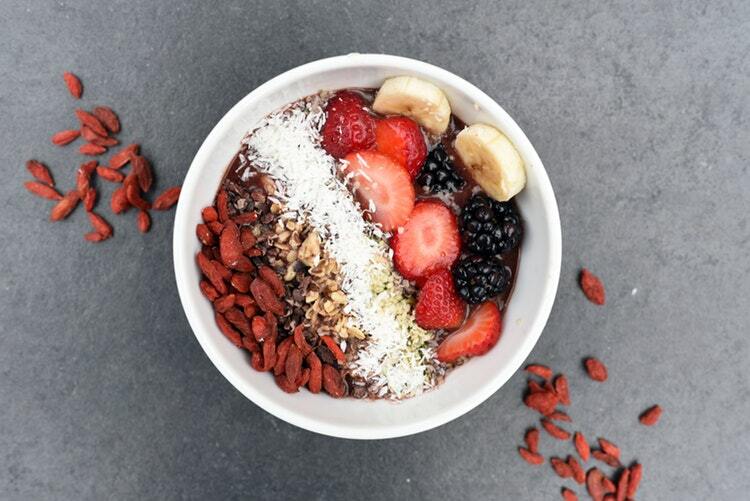 Grab your FREE guide for building performance winning power snacks.